The Wild40/Wild100 EcoSystem™ for 6U OpenVPX is an integrated and agile system architecture for high-end data digitization, signal processing, and storage. It is VITA 65 compliant, designed and built in USA, and ideally-suited for rugged embedded defense and commercial applications. Limited space? Explore our Wild40/100 EcoSystem for 3U OpenVPX. In 2018, Annapolis was the first company to bring 100Gb bandwidth to OpenVPX. The Wild100 EcoSystem is 2.5X faster than existing technology, and enables PCIe Gen-4, 100 Gbps Ethernet, and InfiniBand high-speed bandwidths. This breakthrough capability is made possible by 25Gbps+ FPGA transceivers and high-density MULTIGIG RT3 interconnects. 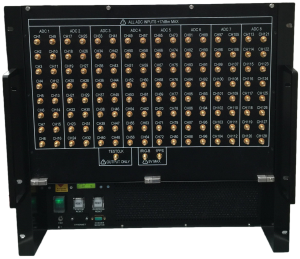 The Wild100 EcoSystem is a growing, interoperable portfolio of rugged high-performance OpenVPX COTS boards and systems that are used for the most challenging data acquisition, digital signal processing, and data storage applications. In 2013, Annapolis was the first company to bring 40Gb bandwidth to OpenVPX. The Wild40 EcoSystem revolutionized the OpenVPX environment with the addition of backplane 40GbE and hot-swappable payload and switch cards. The Wild40 EcoSystem is a mature, interoperable portfolio of rugged high-performance OpenVPX COTS boards and systems. There are two FPGA design methods for every Annapolis product in either EcoSystem. There is a powerful VHDL environment with system-level simulation which is included with every FPGA board, and CoreFire Next™ and Open Project Builder™ FPGA Design Suites, which allows high-level FPGA design using a graphical interface to drag cores (such as FFT or memory) into an FPGA design. If additional design help is needed, Annapolis has an in-house Applications Team that can assist customers with their designs or deliver a complete turnkey solution. With the Wild40/Wild100 EcoSystem for 6U OpenVPX, capturing, transferring, storing, processing and transmitting real-time super-high-bandwidth data is easily achieved. Multi-element arrays in radars and other RF apertures are driving requirements for synchronization of 10s, 100s, and even 1,000s of channels of A-to-D and D-to-A converters. We see more and more customers who absolutely must ensure all converter channels in a system are tightly synchronized to within the exact sample. Also this synchronization must be repeatable and predictable across time, temperature and multiple power on/off cycles. At the same time, speed and resolution of mainstream converters is increasing to multi-GSps sample rates with 12, 14, and even 16 bits of resolution. As converter speeds have increased, increasing levels of sophistication are required to achieve tight synchronization requirements. Annapolis has been developing and delivering deployable synchronization solutions in our COTS product line for over 20 years. As the requirements and challenges have increased, our products have kept pace – we are now in production of our 3rd generation of synchronization solutions. The Annapolis Wild40/100 EcoSystem family of products encompasses a complete architecture designed from start to finish to achieve these tight synchronziation requirements while leveraging high sample rate (3-6+ GSps with 12-14 bits) converters. The Wild40/100 family of products includes A-to-D and D-to-A converter mezzanines, FPGA-based carrier modules, clock distribution cards, as well as backplanes and chassis. As well, Annapolis has a knowledgeable staff ready to work closely with customers to navigate the challenging trade-offs of building COTS-based deployable acquisition and processing solutions for today’s multi-function radar, EW and instrumentation apertures.